From the memorial marker at MacFarlane Park. 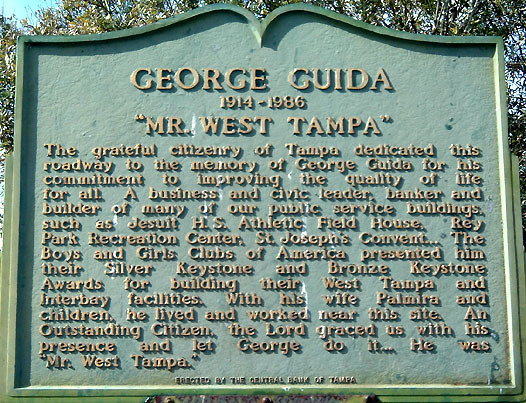 The grateful citizenry of Tampa dedicated this roadway to the memory of George Guida for his commitment to improving the quality of life for all. A business and civic leader, banker and builder of many of our public service buildings, such as Jesuit H.S. Athletic Field House, Rey Park Recreation Center, St. Joseph's Convent. The Boys and Girls Clubs of America presented him their Silver Keystone and Bronze Keystone Awards for building their West Tampa and Interbay facilities. With his wife Palmira and children, he lived and worked near this site. An Outstanding Citizen, the Lord graced us with his presence and let George dot it ... He was "Mr. West Tampa."